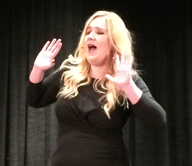 CHICAGO – Chicago resident Missy Wise placed first in the 2016 National Music Theater Competition on Saturday evening at the Marriott Magnificent Mile with a flawless performance, collecting more than $7,500 in cash and prizes for her efforts. Anson Woodin and Jimmy Mavrikes placed second and third, respectively. Judges for the final round were Bob Garrett, Lindsey Levine, Mary Saunders Barton and Darrin Adams. The final two rounds of the National Music Theater Competition were held during the 54th National Conference of the National Association of Teachers of Singing. 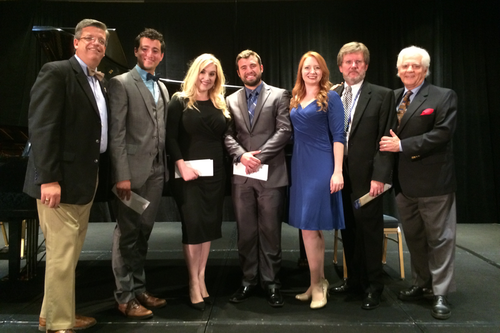 Eight finalists competed for the top award, which is funded by NATS, Hal Leonard Corporation and Virtually Vocal. The semifinal round was held Friday afternoon. Wise, a Louisiana native who lives and works in Chicago, auditioned at the Chicago preliminary rounds. As the winner, she collects $5,000 in cash, a $1,000 gift certificate from Hal Leonard Corporation, a winner’s concert at the 2018 NATS Conference in Las Vegas and a Career Connections package from Virtually Vocal. Her accompanist for the finals was Daniel Stetzel.